Money Matters will present Judaism’s approach to practical economic dilemmas and monetary quandaries that we face daily in both our personal and professional lives. The goal of this course is to provide a sensitive, fair, and unshakable economic paradigm grounded in 3,000 years of tradition and practical experience—an ancient yet fresh spin on how we view ethics of money. Students will emerge from this course with an understanding that only a divine economic system can ensure unequivocal justice while recognizing the virtue in each stakeholder’s position. 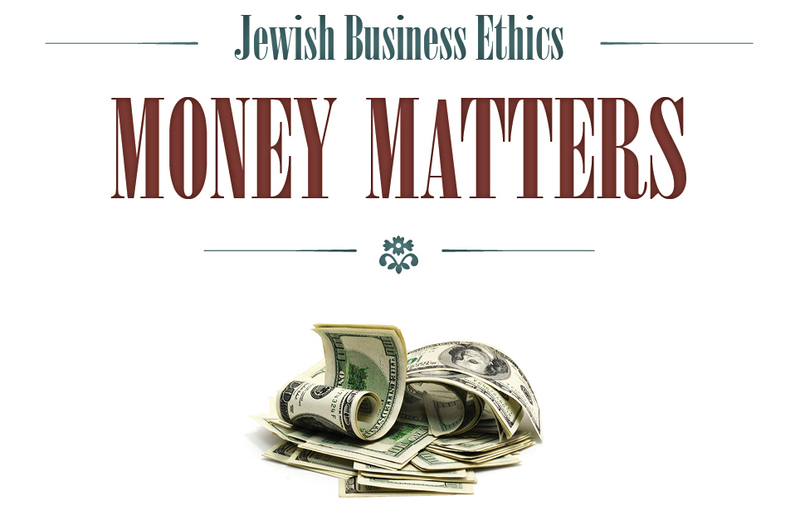 Money Matters will show how the Torah’s sharply discerning yet holistic rulings inspire us with the confidence to confront any ethical economic dilemma. This course is eligible for CLE credits in the following US States: Alabama, California, Colorado, Delaware, Florida, Georgia, Illinois, Indiana, Louisiana, Minnesota, Missouri, Nevada, North Carolina, Ohio, Oklahoma, Oregon, Pennsylvania, Rhode Island, South Carolina, Utah, Vermont, and Washington. Hot Tips: The Ethics of Insider Trading Information is a valuable commodity--this fact has been made clear by recent stories of high-profile prosecutions on insider trading charges. But is it fair to require companies to make information readily available to people who did not expend the time, effort, and money to attain it? Can stealing or misusing information be likened to property theft? How do we set up markets which ensure that risk is apportioned fairly? In this lesson, we will compare and contrast what American law and Jewish law have to say on the subject. By the Sweat of Their Brows: Wages of the Working Poor While a lucky few go home with millions, many more return home in poverty. What is the best way to solve the problem of the "working poor"? Should employers be obligated to pay their employees the minimum hourly income necessary for a worker to meet basic needs? This lesson will explore this hotly debated issue from both the angle of Jewish law, as well as from the perspective of "going beyond the letter of the law"--a central pillar of Jewish business ethics. Morally Bankrupt? The Ethics of Debt Discharge In times of old, when a debtor was not able to repay his debts, he was sold as a slave or thrown into prison. Today, we have bankruptcy laws that protect individuals from this fate. But is it ethical to borrow without repaying? If someone earns the money later in life, should they be obligated to repay their settled debts? This lesson explores the Jewish legal perspective on bankruptcy, emphasizing how we can incorporate secular local laws and customs into Jewish law. State of the Union: The Right to Organize, to Bargain Collectively, and to Strike The controversy over union rights is recurrently strewn across U.S. headlines. What does Jewish law have to say about whether workers should have the right to unionize and bargain collectively? And does it matter whether they are public- or private-sector employees? Should the right to strike be granted, despite the harm it can cause to society? Does the type of industry make a difference? This lesson will present the Talmud's enlightening spin on unionization, collective bargaining, and strikes. Fabulously Wealthy or Filthy Rich? The Ethics of CEO Compensation In the recent economic downturn, much fury has arisen from reports that CEOs of Americas biggest companies take grand bonuses and huge salaries. Is it morally wrong to seek extravagance? Are those who criticize their good fortune just jealous, or is their disgust valid? This lesson will discuss some of the moral problems related to CEO compensation, including some conflicts of interest. Buyer Aware: Another Side to Business Ethics Let's be honest: who isn't looking for a bargain? On the other hand, how often do we question the ethics of our deal-seeking? Can we move to more expensive vacant seats at a ball-game? Is there anything wrong with engaging a sales person with questions about a product when we have little or no intention of buying it there? This eye-opening lesson addresses various scenarios relating to the average market purchase that most of us face daily.